(ASTM type)—are used depending upon the nature of the soil. The cam raises the brass cup to a specified height of 1 cm from where the cup drops upon the block exerting a blow on the latter. The cranking is to be performed at a specified rate of two rotations per second. 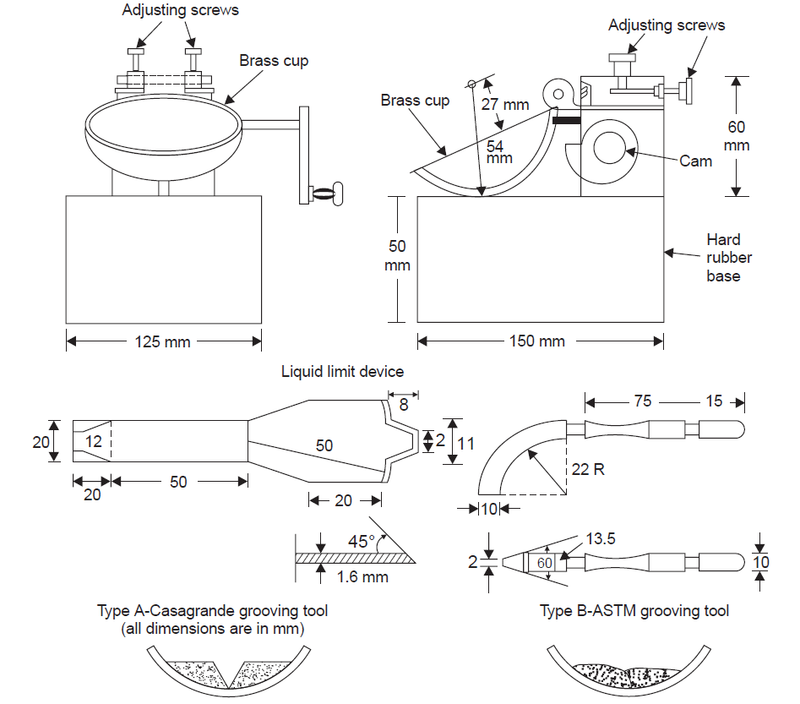 The grooving tool is meant to cut a standard groove in the soil sample just prior to giving blows. Air-dried soil sample of 1.20 N passing 425–μ I.S. Sieve is taken and is mixed with water and kneaded for achieving uniformity. The mixing time is specified as 5 to 10 min. by some authorities. The soil paste is placed in the liquid limit cup, and levelled off with the help of the spatula. A clean and sharp groove is cut in the middle by means of a grooving tool. 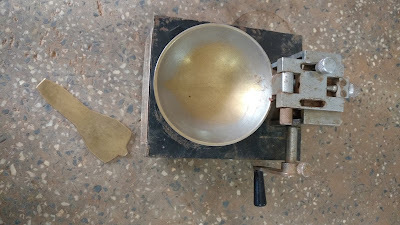 The crank is rotated at about 2 revolutions per second and the number of blows required to make the halves of the soil pat separated by the groove meet for a length of about 12 mm is counted. The soil cake before and after the test are shown in below figThe water content is determined from a small quantity of the soil paste. This operation is repeated a few more times at different consistencies or moisture contents. The soil samples should be prepared at such consistencies that the number of blows or shocks required to close the groove will be less and more than 25. The relationship between the number of blows and corresponding moisture contents thus obtained are plotted on semi-logarithmic graph paper, with the logarithm of the number of blows on the x-axis, and the moisture contents on the y-axis. The graph thus obtained, i.e., the best fit straight line, is referred to as the "Flow-graph’ or ‘Flow curve’. The moisture content corresponding to 25 blows from the flow curve is taken as the liquid limit of the soil. This is the practical definition of this limit with specific reference to the liquid limit apparatus and the standard procedure recommended. Experience indicates that such as curve is actually a straight line. If is the slope of the flow curve, called the ‘flow index’. If will be merely the difference of the corresponding water contents. Attempts have been made to simplify the trial and error procedure of the determination of liquid limit described above. One such is the ‘One-point method’ which aims at determining the liquid limit with just one reading of the number of the blows and the corresponding moisture content. The trial moisture content should be as near the liquid limit as possible. This can be done with a bit of experience with the concerned soils. 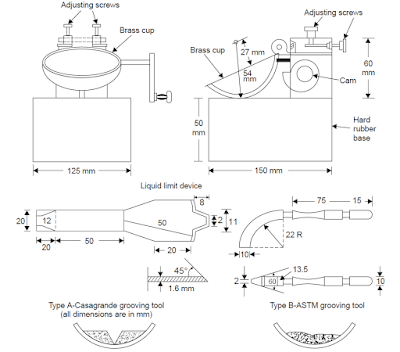 For soils with liquid limit between 50 and 120%, the accepted range shall require 20 to 30 drops to close the groove. For soils with liquid limit less than 50%, a range of 15 to 35 drops is acceptable. At least two consistent consecutive closures shall be observed before taking the moisture content sample for calculation of the liquid limit. The test shall always proceed from the drier to the water condition of the soil. (IS: 2720, Part V-1970). wL of the soil shall be calculated by the following relationship. soils with liquid limit more than 50%.